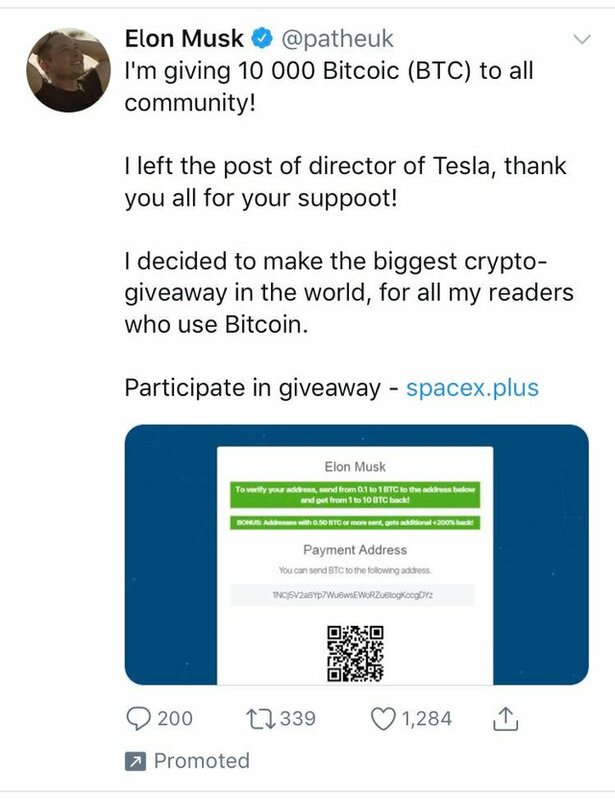 Internet fraudsters hacked several verified accounts on Twitter and disguised them as Elon Musk accounts in order to draw out bitcoins from users. Attackers gained control over the profiles of the British distributor Pathe UK, Matalan department store and the American publishing house Pantheon Books along some other pages. Next, the hackers put in the profiles the name of the head of Tesla and his photos and posted messages about the action on the distribution of cryptocurrency. To circumvent the built-in protection of the social network, the attackers changed the letter “l” in the name to a similar sign. The name and surname remained similar to the real ones, but Twitter did not recognize the deception. The scammers announced that Elon Musk had organized a distribution of 10,000 “Bitcoic” and published a link for those who want to participate. According to the link, in order to participate, you must confirm your wallet address, but this required sending from 0.1 to 1 BTC (Bitcoin). For senders over 0.5 bitcoin, a bonus was provided. Some users of the social media went on about the scammers. The trust of people came from the blue check mark - a sign of a verified account on Twitter. Also, the confidence was added by the fact that other confirmed accounts wrote about the receipt of cryptocurrency in the comments, the hacking of which the users also did not realize. Thus, hackers managed to lure bitcoins from users for $177,000. At the moment, fraudulent messages have been removed, and the profiles of organizations have been restored. The attackers lured bitcoins on Twitter on behalf of Elon Musk not for the first time. As such, in March of this year, some unknown people created an @elionsmusks account and in the comments under the posts of this Elon Musk asked users to send ethereum (ETH/USD) , promising ten times more. In recent months, the use of the Musk image has become so popular among intruders that in October, Twitter blocked his real account for a tweet about bitcoins. Internet fraudsters use verified Twitter accounts, which are practically indistinguishable from the real ones. At the beginning of the year, hackers created accounts on social media that replicated the official accounts of the blockchain startup Tron Foundation and its founder, Justin Sun. At the same time, the fake @TronFoundationl page differed from the real one with just one extra letter in the address and had a blue tick. Subsequently, with these accounts, the attackers offered users to transfer ethereum to a third-party address, promising to return to several of the most successful users amounts that significantly exceed the initial investment. Another hackers’ victim was Telegram CEO Pavel Durov. Unknown hackers cracked a verified Twitter account of the Swedish music group Club 8 and remade it under the account of Durov. This happened after the technical problems encountered with the work of the Telegram messenger. 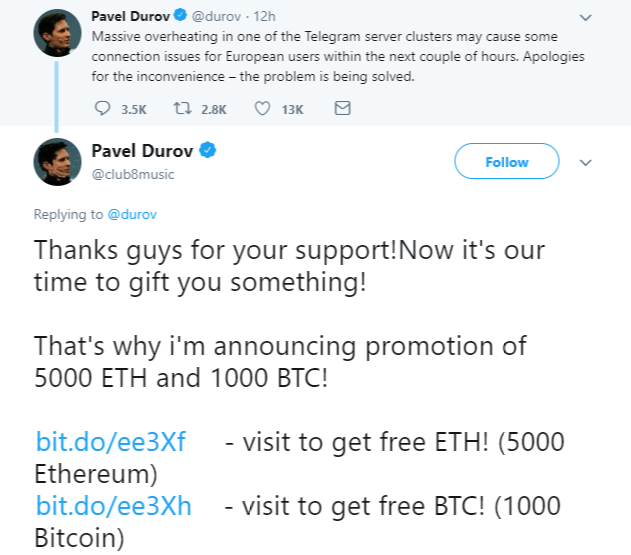 In the discussion thread, the attackers, on behalf of Pavel Durov, thanked Twitter users for their support and offered to participate in the 5000 ETH and 1000 BTC raffle, sending small amounts to the specified wallets. Criminals got to Instagram, too. In this social network, Maltese Prime Minister Joseph Muscat, a well-known fan of blockchain technology and cryptocurrency, came under their sights. Fraudsters created a fake account on his behalf in order to attract his subscribers to participate in an “attractive” investment scheme.